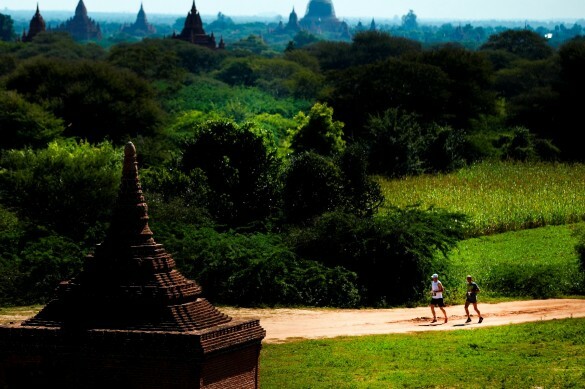 Set in the ancient city of Bagan, the marathon route takes runners on a scenic tour through the stunning pagoda-studded landscape. The holiday package includes social events, tours of Yangon and Bagan, and hotel accommodation. The holiday package does not include the race package which must be purchased separately. It is not possible to purchase the race package without the holiday package. Distances The Bagan Temple Marathon features a classic 42,195 km marathon, a half marathon and for the very first time a 10 km. The distances are colour coded – the marathon is black, half marathon red and 10 km is green. At the race briefing on the Friday – the day before the race – it is possible to change distances. No change of distance is permitted on race day. Drinks Stations Drinks stations serving water are situated along the route. Selected stations also serve energy drinks and bananas. Finish All runners who complete the race within the time limit will receive a medal after crossing the finish line. Water and a lunch pack are given to all participants. Checked in bags can be picked up at the bag check out area. Shuttle busses leave the finish area every hour to bring runners back to their hotel. Age limits Full marathon runners must be minimum 18 years old on race day. Half marathon runners must be at least 16 years old. 10 km participants must be at least 12 years old on race day. 10 km participants under the age of 12 are also welcome as long as they are accompanied by a runner aged 16 or above. Awards All finishers receive a medal. A small, symbolic prize is given to the winner of all distances for men and women. Please note that there is no prize money. Do not forget that this is first and foremost an adventure. We are far away from the comforts and services of a city marathon. The race organizers reserve the right to change details of the race. 3, 4, and 5-star Hotels will be used as descibed in the itineraies and descibed as Standard or Deluxe depending on the package chosen. Six incredible days will be spent in a country laden with sacred temples, pagodas and magnificent natural beauty. 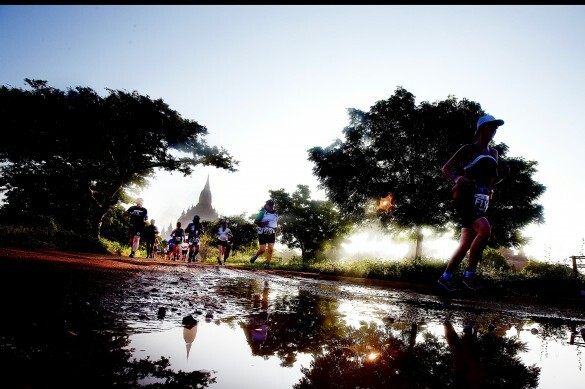 Starting in Yangon, the highlight of the journey will be the marathon event in Bagan. From there, we travel back to Yangon where you can either extend your stay in Myanmar with tours to Inle Lake or Ngapali Beach or explore the rest of this beautiful country on your own. The 6-days tour can be booked either as a standard hotel tour or as a comfort hotel tour. On the STANDARD package tour we use 3* hotels (The hotel in Bagan will have a swimming pool while we can’t guarantee swimming pool in Yangon). On the Deluxe package tour we use 5* hotel in Yangon and 4* PLUS in Bagan. (All hotels offer swimming pool). Runners can choose between three distances: marathon, half marathon and the 10K race. Nov 20: Arrive in Yangon International Airport and make your way to the hotel for check-in. Transportation from the airport is not provided, but there are plenty of taxis and the distance is not far. If assistance is needed a Meet and Greet guide will be present after customs have been cleared. At the hotel your tour leader and local guide will assist with the check in and give information about the coming days. The rest of the day is free to explore Yangon on your own. Nov 21: The day will begin with a city tour of Yangon in an air-conditioned coach. Our first stop will be one of the most iconic symbols of Yangon, the Shwedagon Pagoda which is considered by many to be the 'heart of Myanmar'. The pagoda is believed to be more than 2,500 years old and the central stupa is surrounded by dozens of intricately decorated buildings and statues. Next, we’ll make a visit to the Chauk Htat Gyi Pagoda to see the magnificent reclining Buddha. From here we go to the floating Karaweik Royal Barge and enjoy the quiet settings around the lake. If weather permits, we will see a panoramic view of Yangon from a helium balloon flight taking you up to 50 meters above the ground. The balloon will take up to 15 persons on each ride. It’s attached to the ground with steel cables. We'll enjoy lunch at a nearby restaurant where you’ll taste the exquisite Myanmar cuisine. After lunch, we’ll head to the airport to catch our flight to Bagan. Flight time is approximately one hour and twenty minutes and via a short stopover in Mandalay we will arrive at Nyaung U Airport just outside the Bagan Archeological Zone. After checking into the hotel, the rest of the day is free for you to become acquainted with the magnificent landscape of Bagan. Nov 22: Today we'll explore the ancient area of Bagan. We’ll start with a visit to Old Bagan, the centre of the ancient kingdom. Here we take a closer look at the Bupaya pagoda, which offers great views to the Ayeyarwaddy River and nearby mountains. We continue to the Shwezigon pagoda, built in the 11th century by King Anawratha. Still an active place of worship it stands today as one of the most astonishing and well-kept pagodas in all of Bagan. We finish our sightseeing with a visit to the lesser visited pagodas at Tayok Pyi Paya and the village of Minnanthu, both part of the running course tomorrow. Back at the hotel the rest of the afternoon is free to relax and prepare for tomorrow’s race. In the evening we carbo-load with a pasta dinner in the hotel or a nearby restaurant. Nov 23: Today’s the big day! After an early breakfast at the hotel, we hop on a coach to Hti Lo Min Lo Temple where the marathon, half marathon and 10K race start and end. Running amid the pagoda-studded landscape, we’ll experience Bagan in all its glory and pass by small picturesque villages and farmland. After the race, we’ll enjoy some snacks on the steps of the iconic Hti Lo Min Lo Temple. Shuttle busses will take all participants (runners and spectators) back to the hotel where the rest of the day and evening can be enjoyed as you prefer. Today is free to relax, enjoy and explore at your own pace. Whether you want to relax at the hotel with a cold drink or rent a bike and explore more of Bagan is up to you. If your legs can carry you why not pay a visit to Ananda Temple, a whitewashed masterpiece of Mon architecture. With its four standing Buddhas and adjacent brick monastery with well-preserved 18th century murals, this temple is one of Bagan's most significant. Close by is also the Thatbinnyu Temple dating from 1144, also known as the temple of omniscience. Or why not pay a visit to one of the local villages or follow the running course to the majestic Dhammayangyi Temple for a closer look. In the late afternoon we’ll meet, and the rest of the evening is dedicated to celebrating our achievements of yesterday. A festive dinner and awards ceremony will lead to an unforgettable evening. Nov 24: After an early breakfast and checkout, we head to the airport for our morning flight back to Yangon. Flying time is approximately 1 hour and 20 minutes and arrival in Yangon is estimated before noon. However, flight times are not yet confirmed and delays do occur, so it is NOT recommended to book your onward flight out of Yangon earlier than 15:00 today! You can also choose to extend your stay in Myanmar and book the tour to the idyllic Inle Lake or go to the perfect beach retreat at Ngapali Beach. The 8-day tour offers visitors an incredible voyage to a land of immense natural beauty. The journey begins in Yangon from where why will fly to the former royal capital of Mandalay. The highlight of this trip will undoubtedly be Bagan and the marathon that will take place there. After the race, we travel back to Yangon where you can either extend your stay in Myanmar with tours to Inle Lake or Ngapali Beach or explore the rest of this beautiful country on your own. The 8-days tour can be booked either as a Standard hotel tour or a Deluxe hotel tour. The boat used from Mandalay to Bagan is Standard level. On the Deluxe package tour we use 5* hotel in Yangon, 5* in Mandalay and 4* Plus in Bagan. (All hotels offer swimming pool). The boat from Mandalay to Bagan is also of a high level. 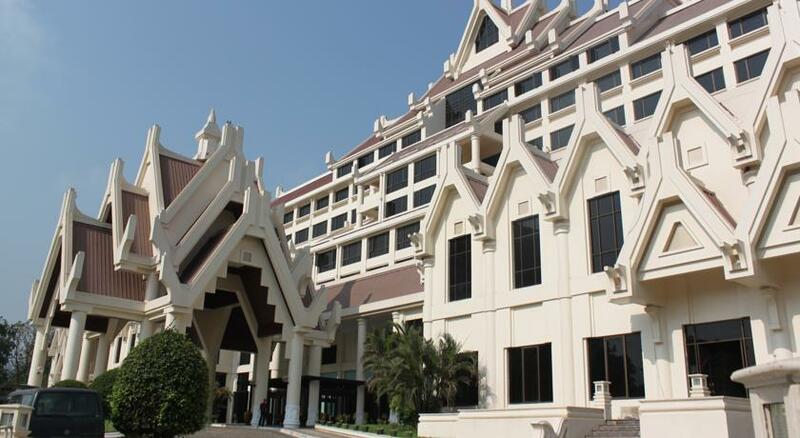 Nov 18: Arrive in Yangon International Airport and make your way to the hotel for check-in. Transportation from the airport is not provided, but there are plenty of taxis and the distance is not long. If assistance is needed a Meet and greet guide will be present after customs have been cleared. Nov 19: The day will begin with a city tour of Yangon in an air-conditioned coach. Our first stop will be one of the most iconic symbols of Yangon, the Shwedagon Pagoda which is considered by many to be the 'heart of Myanmar'. The pagoda is believed to be more than 2,500 years old and the central stupa is surrounded by dozens of intricately decorated buildings and statues. Next, we’ll pay a visit to the Chauk Htat Gyi Pagoda to see the magnificent reclining Buddha. From here we go to the floating Karaweik Royal Barge and enjoy the quiet settings around the lake. If weather permits, we will see a panoramic view of Yangon from a helium balloon flight taking you up to 50 meters above the ground. The balloon will take up to 15 persons on each ride. It’s attached to the ground with steel cables. We'll enjoy lunch at a nearby restaurant where you’ll taste the exquisite Myanmar cuisine. After lunch, we’ll head to the airport to catch our flight to Mandalay. Flight time is approximately one hour and thirty minutes. After checking into the hotel in Mandalay, the rest of the day and evening can be enjoyed as you prefer. Nov 20: After breakfast, we head off for more exploration of Mandalay and its surroundings. Starting from the ancient royal capital of Amarapura, we are heading to the world’s longest wooden bridge that was built in 1782, the U Bein Bridge, which spans 1.2km. Next, we will also make a visit to Burma's largest Buddhist monastery: Mahagandayon Monastery. It is home to more than 1,000 monks and monks to be. Our journey continues to the highly revered Mahamuni Pagoda where we will also see the work of local craftsmen. We will enjoy lunch at a local restaurant followed by a visit to what is known as the world’s largest ‘book’, the Kuthodaw Pagoda, which houses the entire collection of Buddhist scriptures. Nov 21: Following early breakfast, our group will drive to the Irrawaddy River, where a boat will take us on a journey to one of southwest Asia’s finest treasures, Bagan. This boat trip takes approximately 8-9 hours, and the atmosphere onboard is quite relaxed. While underway, we will witness life along the river and cruise past cities, monasteries and pagodas. We will arrive early in the evening, just in time to witness a beautiful sight – golden rays light as the sun sets over the 42 sq. km. grassy plains of Bagan and its more the 3,000 historic Buddhist temples. This mystical landscape is sure to take your breath away. Nov 24: Today is free to relax, enjoy and explore at your own pace. Whether you want to relax at the hotel with a cold drink or rent a bike and explore more of Bagan is up to you. If your legs can carry you why not pay a visit to Ananda Temple, a whitewashed masterpiece of Mon architecture. With its four standing Buddhas and adjacent brick monastery with well-preserved 18th century murals, this temple is one of Bagan's most significant. Close by is also the Thatbinnyu Temple dating from 1144, also known as the temple of omniscience. Or why not pay a visit to one of the local villages or follow the running course to the majestic Dhammayangyi Temple for a closer look. Nov 25: After an early breakfast and checkout, we head to the airport for our morning flight back to Yangon. Flying time is approximately 1 hour and 20 minutes and arrival in Yangon is estimated before noon. However, flight times are not yet confirmed, and delays do occur, so it is NOT recommended to book your onward flight out of Yangon earlier than 15:00 today. In this cooking class the local chef will teach us to cook traditional Myanmar food. We will of course all sit down at the end of the class and enjoy our cooking, while the chef will hand out full recipes, so we can impress our friends and family at home. Your day will begin with an early ride from your hotel on one of the vintage buses dedicated to the journey, and upon arrival to the location, snacks, coffee and tea will be expecting you. As you enjoy the refreshments, you will be able to witness the preparation process of the balloons being inflated. This is followed by a safety briefing and then, at dusk, it is time for takeoff! The balloons are piloted at no more than 15mph by skilled professionals with years of experience, who also enjoy narrating the speed/direction strategies of steering the balloon. This experience provides an ever-changing perspective of the archeological sites and beauty of Bagan you won’t be able to seize otherwise. Please note that due to the limited space in the basket, there are weight and height requirements. After a graceful landing of the balloons, staff will be waiting for you with fresh pastries, fruits, and a glass or two of sparkling wine to conclude this excursion with a celebration of your flight. Height, weight and age restrictions: Any passenger in excess of 125kg/280lbs, or any passenger who requires the space in the basket for 2 passeners, will be required to book the additional extra space at the time of booking and pay 100% surcharge of the ticket price. Minimum height 1.37mts, Children under 8 years can not fly, children 8 to 16 years must fly with an adult. Mount Popa is an extict volcano and is considered the abode of Myanmar's most powerful Nats (spirits). Once we reach the top of the mountain, there is a monastery with ancient golden stupas. We will have to walk up about 20mins to reach the top, on the way there are monkeys we can feed. Although it is a popular retreat for locals, Ngapali has retained its lazy, fishing town appeal for decades. Spend four glorious days basking in the sun and give your body a well-deserved break from the exertions of the marathon at the Amata Resort. Rustic fishing settlements are scattered around the area, making Ngapali a perfect base for exploring other small towns and villages. Or why not go snorkelling and discover the underwater world off the shores of the beach? Whatever your interests, Ngapali is the perfect destination for the end of your Myanmar journey. After breakfast, we fly to Thandwe and drive to the village of Ngapali. Check in to our hotel, the Amata Resort, and spend the rest of the day at your own leisure. Go for a stroll in the village and enjoy delicious local dishes, swim in the crystal clear water or have a nap under the swaying palms. Just relax and enjoy the beautiful surroundings! Snorkel, swim or just laze on the beach. Enjoy your last day! After breakfast and check out we head to the airport for our flight to Yangon and your onward journey. Flying time is approximately 1 hour and 20 minutes and arrival in Yangon is estimated before noon. However, flight times are not yet confirmed, and delays do occur, so it is NOT recommended to book your onward flight out of Yangon earlier than 15:00 today. Famous for their special leg rowing technique, the Intha people are one of several hill tribes living on and around Myanmar’s second largest lake. The beautiful floating gardens dot this vast lake and make up for a meditative landscape to sail around. On shore crumbling stupas at the foot of the mountains enhances the dreamlike scenery and it is almost as if you are on a different planet. If the included guided tours aren’t enough, you can rent a canoe and paddle through the calm waters or take a bicycle and explore the lush countryside. Either way, Inle Lake is balm for the soul. After breakfast and checkout, fly to Heho. En route to Nyaung Shwe, we visit the Shew Yan Pyae Monastery. Then we stroll through the local morning market before sailing to Inle and check in to our hotel. Wake up to the serene surroundings of the lake. Today we enjoy a full-day boat tour on the lake. Its calm waters are dotted with floating vegetation and fishing canoes. Experience the lake's unique 'leg rowers' - Intha fishermaen who row standing up with one leg wrapped around a single oar, leaving their hands free to work the conical fishing net. We stop at Phaung Daw Oo Pagoda, the holiest religious site in southern Shan State. Visit a traditional silk-weaving workshop which uses wooden handlooms and a blacksmith's forge. Pass endless floating gardens, where Intha lake dwellers grow fruit and vegetables. Continue by boat to visit Nga Phe Kyaung Monastery, one of the oldest on the lake, where you can see exquisite Buddha statues which are more than 200 years old. Explore a 5-day rotating market (if your visit coincides with the schedule) which offers an insight into the life of the ethnic Pa-O, Danu and Intha people who come to these markets to sell and buy goods. long-tailed boat across the lake to Indein , at the western end of Inle, for one of the most scenic trips on the Lake. Passing through the busy village of Ywama, the largest on the Lake, with many channels and tall teak houses on stilts; enter a long, often tree-lined canal, either side of which farmers cultivate their land against the backdrop of the Shan Hills. Disembark at the jetty and walk for 15 minutes through Indein village to reach the 14th - 18th century pagoda ruins of Nyaung Ohak. . A covered walkway popular with souvenir stallholders leads up to Shwe Inn Thein Paya, a complex of weather-beaten 17th - 18th century zedi; some newly reconstructed. After breakfast, transfer to Nyaung Oo Airport depart for Yangon by morning flight. Flying time is approximately 1 hour and 20 minutes and arrival in Yangon is estimated before noon. However, flight times are not yet confirmed and delays do occur, so it is NOT recommended to book your onward flight out of Yangon earlier than 15:00 today. And a 3-hour hike up Mount Victoria’s upper path, with an incredible sight once exiting the forest! We will begin this program with a brief meet and greet at the hotel and then begin our long drive on a small passenger car from Bagan to Mindat. Along the way, the path can sometimes be rocky and bumpy and cattle can often be seen running through crop plantations and meadows. Lunch will be provided along the way. We will briefly stop at Chin village. This day will be good for scenic photography and interacting with the local villagers, and will conclude with the arrival to Mindat, 4860 feet above sea level. Dinner will be provided at the hotel. For our second day, we will begin with breakfast at the hotel and then head towards the Chin Village. Here we get to meet the locals, including some of the Chin women who still dress in their traditional attires, smoke tobacco pipes, and, depending on their age, might even have their faces covered in intricate traditional tattoos, a rite-of-passage practice that signified their arrival to womanhood, with symbols representing identifying messages of each tribe, and which is now outlawed by the government. We will have lunch at a local restaurant and then leisure time to wander around the city center and local market in Mindat before heading towards Kanpetlet, where we will spend the night at a simple hotel. After an early breakfast at the hotel, we will go through the town of Kanpetlet to visit some of the smaller villages, enjoying the sight of the churches and simple homesteads, decorated with buffalo corns. This quiet rural backwater and tranquil environment will provide the perfect setting for a picnic before our next adventure. Afterwards, we’ll drive to the National Park’s upper base camp to head for the summit of the wondrous Mount Victoria, which stunning nature and biodiversity has earned it the title of ASEAN Heritage Park. Although the footpath is a little steep, the reward of this hike is the unbelievable view once we come out of the forest, rich with bird life and rare flora and fauna. After our 3-hr hike, we return to upper base camp and down to our hotel in the picturesque old town of Kanpletet. Today, we’ll have a morning breakfast at the hotel and then begin the drive to Bagan (150km), driving along the mountainous areas, through mist and quiet valleys. Arrival to Bagan, where guests will board domestic flight and fly to Yangon where the tour ends. We do not recommend you to book an evening flight out of Yangon because domestic flights often get delayed. Final balance payment is due 10 weeks before travel - bookings made within 10 weeks of departure are full payment at time of booking.